So have you gotten a chance to try these yet? 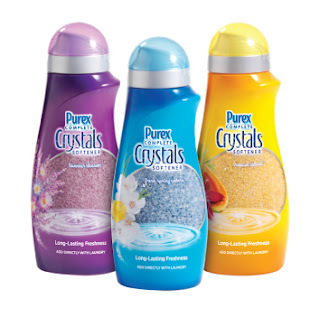 As a Purex Insider I was one of the very first people who got to try them out, pretty cool! As many of you already know Amber has eczema which basically means that most of the time fabric softener is just out of the question. When we first moved back to NC she had a horrible, horrible outbreak which I eventually traced back to using liquid detergent at a friends house while we were waiting to get our washer and dryer back. It’s nasty stuff for babies with sensitive skin! So I was a little worried that I wouldn’t be able to use this kind for the same reason. I gave it a try though, (used a much smaller than normal amount when her and Tyler’s clothes were in there) and it didn’t cause her or Tyler to break out! Yey! I also used it to wash the loads w/o their clothes in it like our towels. I *loved* that it made my entire laundry room and kitchen area smell soooo good! I’ve never experienced that with any type of detergent or softener before! The fact you can throw it in at the beginning of the cycle is awesome as well since this apartment doesn’t have a fancy washer with a softener dispenser. I was super pleased with these so far and would definitely recommend them–I’ve heard many fellow friend’s and bloggers raving about them as well! Here is some cool information that I found really interesting about the Crystals and so I thought you might as well! You can buy them at Wal*Mart or just about anywhere fabric softener is sold!